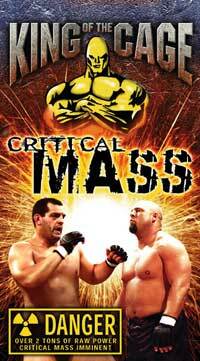 Catch an all new episode of Full Contact Fighter TV tonight on MSG Network at 11:30PM (Eastern time). A preview of Williams vs. Rodriguez which includes comments from Pete Williams, Ken Shamrock and Ricco Rodriguez. Results from FCF interactive UFC 34 poll. This episode will also air on TSN tomorrow, October 31st, at 7:30PM Eastern. New KOTC Video Now In Stock! Which style will remain supreme? Which man will be left standing? Who will be the King of the Cage? Due to programming and technical errors, the Saturday night airing of Super Brawl 21 aired late and without the play-by-play and color commentary. Hawaiian Channel 5, better known as "KFIVE the Home Team", the local UPN affiliate, in Honolulu, Hawaii will now air Super Brawl 21 on two additional nights this week. Wednesday, Halloween at midnight and again on Thursday night at midnight. Also, check out there website, http://www.k5thehometeam.com/ to view the show online. Friday’s Super Brawl 22, will be available for viewing on Saturday, November 3rd online and on KFIVE at a date to be announced. Check it out!! 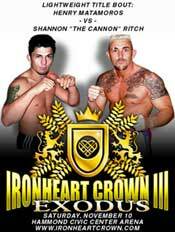 IRONHEART CROWN LIGHTWEIGHT TITLE BOUT HEATS UP! HAMMOND, IN – For the past few weeks, Chicago and northwest Indiana fight fans have been on the edge of their seat, eagerly awaiting the upcoming lightweight title bout between current champion Henry Matamoros and the challenger, Rolando Higuerros. This exciting match had been one of the event’s highlights, driving ticket sales and inciting a buzz among the local martial arts community. Then, a promoter’s worst nightmare unfolded as an old knee injury put Higuerros out of action, taking some of the punch out of what had been a great line up. "That fight was one of the best matches ever slated in Chicago," former IHC promoter Eric Moon remarks. "It was the fight that I was personally anticipating the most, and I’m sure that a lot of the fans were looking forward to it as well. I was crushed when I heard of Rolando’s injury. Thank God Shannon called." Shannon? Shannon "The Cannon" Ritch? Against Henry Matamoros? It may sound too good to be true, but just days after the show’s best match-up turned cold, it has been re-ignited, burning even hotter than before! Shannon Ritch, training out of Buell Fighting Systems in Coolidge, Arizona is the current Internation Sport Combat Federation U.S. Champion with a mixed martial arts fighting record of 53 wins and 22 losses. He has been featured in Japan’s Pride, Hawaii’s SuperBrawl, Holland’s MixFight, and other major events including the Extreme Challenge and the King of the Cage. He has faced the best world-class A-level fighters in the business, including Kazushi Sakuraba, Frank Shamrock, and Dennis Hallman. While Rolando Higuerros was a worthy opponent for Henry Matamoros, Shannon the Cannon brings much more to the table, adding to the aura of this upcoming event. But is Shannon Ritch more than Matamoros can handle? "I don’t think so," Moon says. "Shannon has a lot more experience, but Matamoros is no novice. Henry has a record of 27 wins and only 5 losses. He has also fought in big shows and faced notable opponents, and he has maintained an incredibly good record in the process. I think Shannon is a much stronger striker, but Henry has a supernatural ability to take a punch, and his submission skills are as good as they get. It won’t be easy for him, but Henry definitely has the tools to win this fight and keep his title. It’s a great opportunity for him to get his name out. He really hasn’t gotten the recognition that he deserves." Obviously, Eric Moon thinks this is a good match, and for whatever its worth, the internet community seems to be in agreement. Just hours after the deal was made, an unknown source posted the information on the "Underground Forum" at mixedmartialarts.com, the internet’s hottest source for mixed martial arts information. In response to the thread, half of the posts predicted a win for Mataomoros, while the other half predicted that Ritch would be victorious. Opinions are divided, but the overall consensus seems to be that it will either be Matamoros by submission, or the Cannon by knockout. All agreed that it would be a great fight. "People can say what they want on the forums," Moon says, "but the outcome will be determined in the ring by these two great fighters. I can’t believe that this fight just fell into our laps. Its going to be awesome!"